This is my newest op-ed, published today in the Free Press. In general, I am proud of it-the editing was fine and I believe in what I said. I love that it ran in the weekend paper, so more people might see it. However, writers never get to choose the headline. I am upset about this one. If a man wrote about getting good and equal access to healthcare, childcare, job equality and its effects on the tax base...everyone would say, "oh, right, of course, that is entirely reasonable and logical." If I write about it, as a woman, as a mother, as a (gasp) feminist, I am roaring. I am somehow making an (implied inappropriate?) loud noise and by implication, a statement about what women have to do to request a fair and equal status. Really? That makes me sad. Not as sad, of course, as the struggle to get a fair wage, to have good access to the kind of healthcare I'd like, or to have decent and affordable childcare....but sad that the editors decided that what I wrote was somehow full of lioness rage, rather than full of a sort of legitimate frustration and an obvious logic about how to boost the tax base. Boo. 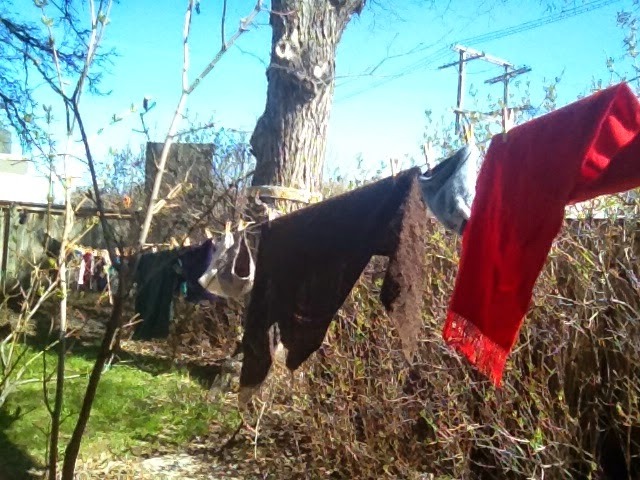 So, the clothesline has not been out in quite a while. Of course, doing extra spring cleaning was also not on the agenda. I am surprised by and enjoy small things these days. The last bit of news was knitting related. 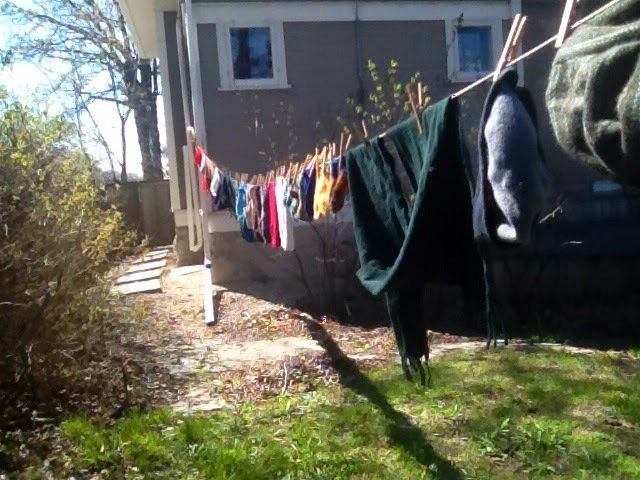 In April, I was surprised by wonderful online pattern sales on Ravelry. I have no idea why. I'd done no advertising and only one new pattern in the last several years. The only different thing was posting those new pdfs from Knit Green and Fiber Gathering. So, I seized upon the opportunity and decided to do a small notebook ad on Ravelry to see if good sales continued. As May closes, I can conclude that it did absolutely NOTHING and I have sold almost no patterns in May! I am trying to embrace unpredictability. It goes against my nature, but then, life with almost three year old twins is different from one moment to the next. (Potty training, for instance, is a truly unpredictable enterprise--different with each kid and from day to day.) Time to try to enjoy any small positive change...like the first cherry blossoms and flower bulbs blooming this spring. I thought you might be interested in some of my latest adventures. A little while ago, I heard that someone was giving away "free wool" but the story was more complex than that. The short version? A local stable was going through a transition and had an empty arena and a lot of empty loose boxes indoors this winter. The province animal welfare folks seized a flock of sheep, plus 2 guard llamas. I have no idea of the details, but this farm ended up with 40 sheep. The flock was not in good health; there were dead animals in the field. The flock was cared for by the provincial vets and animal control folks and stayed indoors in the arena, warm and dry, during our very cold winter. (-20 to -40 can be too cold for sheep to be outside without any sort of shelter, too!) Before the sheep were sent on to their new home, a shearer came in and helped out. Some (or all?) 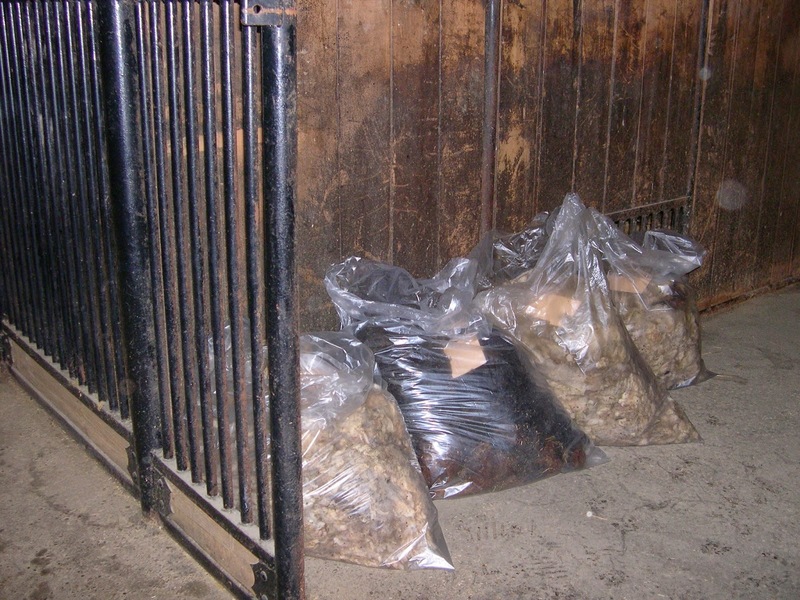 of those 40 fleeces ended up in a loose box in the stable in March. Although I think the shearer did do brief skirting, there was no sorting or careful containment as this shearing was entirely for health reasons. Sheep who have been stressed often have breaks in their fleece, and some of these sheep had serious health concerns. The stable had very caring horse people there, but they knew nothing about sheep or wool. By the time I got out there with a friend to really help go through the fleeces, it was maybe 2 months later. To our surprise, it was, in some part, a wool flock. There were a mixture of breeds, Jacob and Jacobs' crosses, Icelandic, and some fine wool white sheep. When I was a kid, just learning to spin, a huge pile of free raw wool seemed like a good dream. Unfortunately, adults know those pesky details can get in the way. What happened? 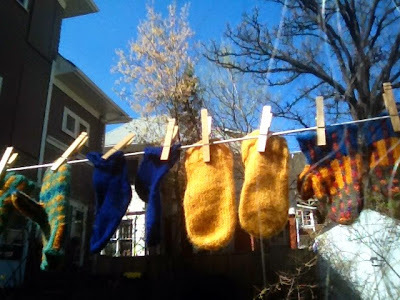 My friend and I managed to salvage 4 fleeces that looked ok. One dark brown/reddish Icelandic fleece, a Jacob, and a couple of fine wool (one was maybe a Finn cross) fleeces. We were making good progress on a very windy, cold day on the prairie. We were indoors, but it was cold and wet and we had only a couple hours before I had to head back to town for preschool pick up. I stepped into that great mound of wool to retrieve half a fleece and (if you are squeamish, please sit down now) mice TEEMED out of it. I screamed, of course, it was surprising. Not really surprising, in retrospect, as I would choose that place to nest if I were a mouse, but...when I described it to my boys, they said, "TWO mice?" and I said no. They said "TEN mice?" and well, I said, "Ok, ten." It was more than ten. 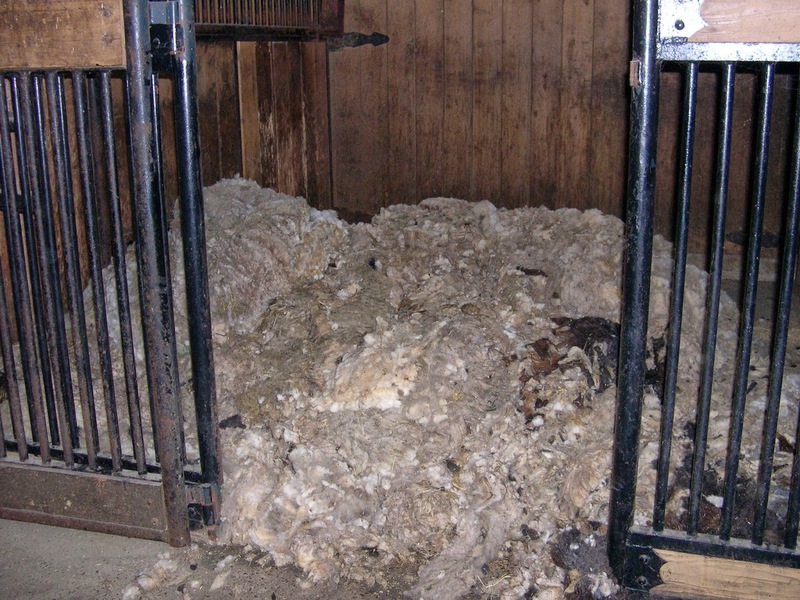 Worse, after that moment, the next 4 or 5 fleeces were checked were damaged beyond repair. There was water penetration in the stable from a large snow bank and the fleeces were very wet. We're not sure how many fleeces were from sick sheep, or if the water or the pest infestation was the problem. Short version? The rest had to go to the landfill. Sad, but true, especially because getting rid of those mice was important, too. What happened to the fleece? 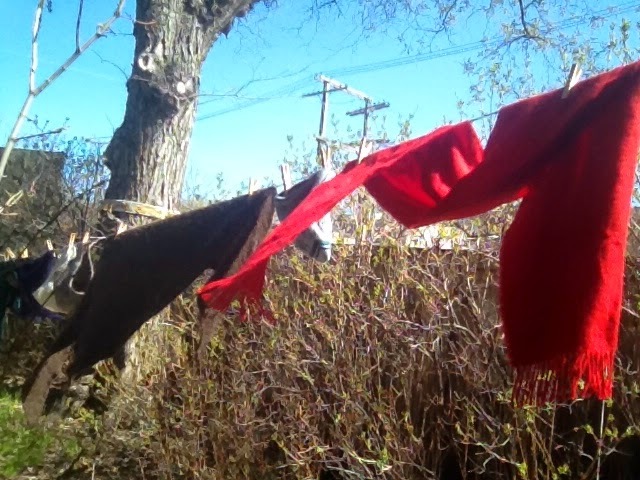 I ended up parking 4 fleeces on my front porch. I washed them all--not to get them spotlessly clean, but clean enough so someone would be willing to bring them into their house. 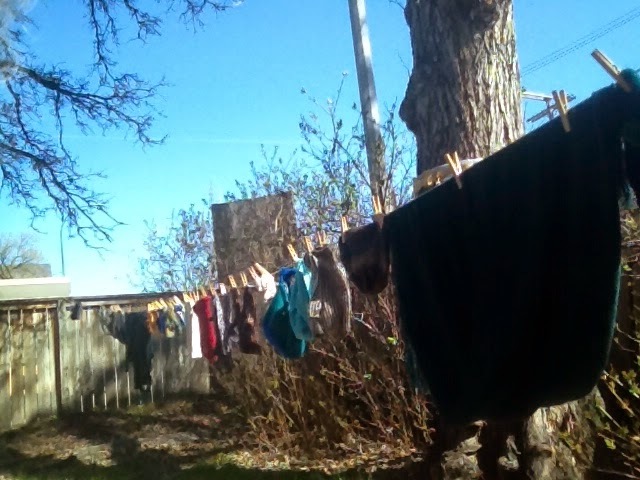 The Icelandic and Jacob fleeces have gone a new home for $15 a piece, to benefit the Manitoba Fibre Festival. I have two white (ish) fine wool fleeces left....good for felting or maybe for spinning. They will require a thorough second cleaning and do still have vegetable matter in them.... Drop me a note with contact information if you are interested. ﻿I know that many spinners these days focus almost exclusively on cleaned wool roving and even hand-dyed roving. Some people never process a raw fleece from scratch. Meeting sheep and being at shearing day, starting from scratch? This has been one of my great joys as a spinner. I have more than one garment from a friend's sheep--and I was there to catch it when it was shorn, I washed it, I teased, carded or combed it, I spun it, I knit it...I like this process. I also like being there to try to save something from nothing. These rescue sheep have gone on to a better home. I hope now a small fraction of their hard work, their wool, can be made worthwhile. I cannot say the same about yarn. I occasionally get a crush. Sometimes, the crush is totally fulfilled and runs its course. Icelandic yarn, while I will always love you, while I will return back to you, I'll have to say that my crush is over for now. I spent this entire winter knitting SOMETHING out of Lopi. I made a bathmat, two women's sweaters and two little boy sweaters. Most, if not all of that knitting happened while the boys watched their 20-40 minutes of Sesame Street, Caillou, Thomas, Busytown, or Curious George in the evenings while drinking their bedtime milk. (We have recently started watching Clifford, it is a thrilling alternative.) I sit nearby and knit as fast as I can. Any more complicated knitting happens around nap or night time, and I am usually denying myself sleep to do it. You'll note that there is not a single photo in this post. This way, if you do not feel the urge to fall in love, to look at yarn p*rn, to covet, you don't have to. Now you know what I do when I am faced with hours of mindless child-related clean up, or when I am up AGAIN in the middle of the night. I dream of yarn, of course. PS: Trust me, no one is paying me a dime to promote or link to their yarns. Not even a skein. I'm just, well, crushing too much to hold it in.